iPhone and iPad users, take advantage of all the great real estate listings in Telluride CO and the surrounding areas with our new iPhone and iPad search tools. 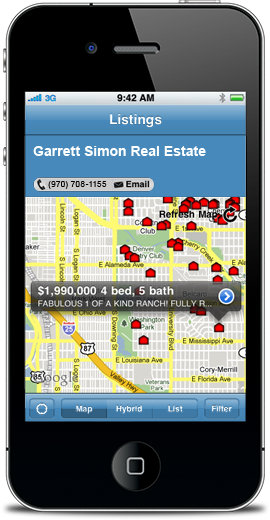 Quickly and easily find real estate listings, contact Garrett Simon Real Estate directly from the app and more. To install the app, iPhone and iPad users will need to download the myAgent IDX app from the iTunes App Store. Click the graphic to the left to download. You may also easily locate the myAgent IDX app by searching the keyword "IDX" inside the iTunes App Store or use the QR code below. 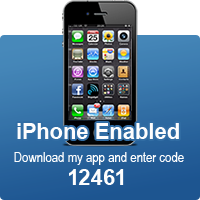 After Installing the iPhone or iPad app, enter code 12461 to begin. To use our iPhone and iPad app search tool, enter 12461 into the IDX Agent code field. This tells the app which MLS area to search. This code is unique to Garrett Simon Real Estate and allows you to access real estate listings from Telluride and all of the surrounding areas. Once you enter your one-time agent code (12461), it will be stored in your preferences and will not have to be entered again. Scan the QR code below using your iPhone and be taken directly to the app in the iTunes App Store on your phone. It doesn't get any easier than that. Make sure to enter code 12461 into the IDX Agent code field. Looking for a QR Code Reader? We suggest RedLaser for iPhone and iPad in the iTunes App Store.